More than three million Joe Wicks books sold worldwide Do you find it tricky to balance being healthy with cooking for a crowd? 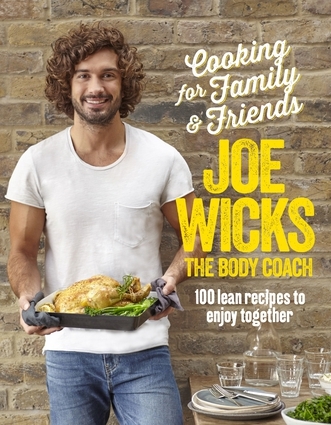 Author Joe Wicks, aka The Body Coach, presents this gorgeous book featuring more than 100 delicious and nutritious recipes that are perfect for sharing with the special people in your life. Joe has helped hundreds of thousands of people to transform their bodies and feel amazing with his effective workouts and simple recipes. All of the recipes here are organized into reduced-carb and post workout chapters, just like Joe's first three Lean in 15 cookbooks. This makes it a perfect addition for those already familiar with Joe's eating structure (carbs following workouts or on active days) but the meals are also enjoyable and tasty for all, whether you are following Joe's plan or not. Cooking for Family & Friends is a beautifully photographed collection of Joe's easy favorites and crowd-pleasers, such as Roast Chicken with Celeriac Mash and Bacon Greens, BBQ Ribs with Dirty Corn, and Tandoori Chicken Thighs with Chapattis. All the recipes are big on flavor and packed with the hero ingredients you need to impress your friends, fuel your workout and burn fat. Includes metric measures. Joe Wicks, aka The Body Coach, has helped countless people achieve new levels of fitness and fat loss with his 90 Day Shift, Shape and Sustain program and his Instagram account. He is also the author of Lean in 15: 15-Minute Meals.